This is a great location to build family memories. A unique location with a large flat lot down to your own sandy beach. 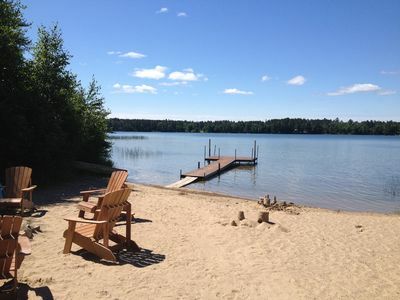 The lake is crystal clear and shallow sandy bottom perfect for little children and adult swimming. The cabin is surrounded by large Norway Pines & White Birch. Wildlife about including a regular visit of a Bald Eagle. Great spring fishing for large mouth, small mouth, walleyes and northerns. Fall brings beautiful colors for a quiet getaway. 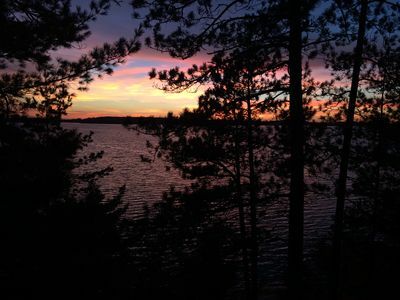 The cabin is full of large picture windows giving you a full view down the lake and comes fully equipped. - Cabin is approximately 1200 sq. ft.
- Indoor shower, microwave, washer / dryer, 2 refrigerators. - Bedding sheets / blankets. - Shallow clear sandy bottom lake. Great for small children. - Screen porch with picnic table and sitting area. - Restaurants and resorts close by for dining. - Fishing boat available along with a few fishing rods / tackle. - All cooking needs, utensils, plates…Electric stove , Weber Barbeque, portable electric griddles. Everything you need. I have been renting this cabin for over 15 years and we have people come year after year. Get your reservation early because summer weeks are coming soon. Pontoon Rental - We now have a 2018 Sun Tracker 20 foot pontoon with 115 HP Mercury 4 Stroke Engine which can provide loads of fun for tubing, fishing or just cruising the lake with the family. 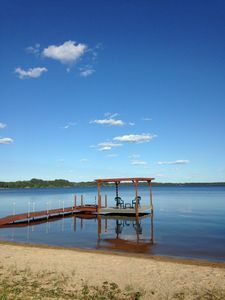 Contact us to find out the rates for rentals on the pontoon. 4 - Person Peddle Boat - 4 person peddle boat for kids to enjoy. 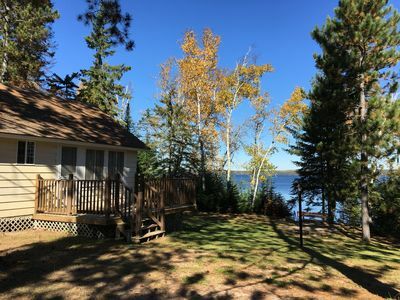 Beautifully Remodeled Cabin on Big Sturgeon Lake in Side Lake, Mn.